African Cichlids, Meet the world record breakers! Coming from the continent of Africa are the largest, smallest, and most beautiful cichlids on the planet! African cichlids take the prize for the largest and smallest cichlids in the world! The Nanochromis transvestitusus is the smallest known cichlid, barely reaching over an inch in length. On the other hand, the Boulengerochromis microlepis is the largest recorded cichlid. This whopper reaches up to three feet in length! If there was ever a group of fish that could rock the aquarist’s world, it would be the African Cichlids. There are well over 1,400 species and variants and they are so diverse in coloration, body shape, and habitat that there’s a fish for every hobbyist. Top that off with their curious and provocative behaviors, and they quickly transform the aquarium into a conversational showpiece. One look at the Peacock Cichlids from Lake Malawi gives a quick idea of just how very colorful these fish can be. This group is brilliantly adorned in blues, reds and yellows and they are some of the more peaceful cichlids as well. But Lake Tanganyika is not to be outdone! The Tropheus are perhaps the “king of color!” Within just 6 species there are over 120 known varieties that display combinations of every color found in the rainbow. There are so many gorgeous Tropheus cichlids from this lake that they haven’t yet all been described. Size and color are just the beginning for this incredible group of fish; they are further complimented by their remarkable behaviors. African cichlids have a highly complex, yet ritualistic social structure within their species. For some that translates into being highly territorial aggressors, but for others it means peacefully schooling with their family. Their behaviors extend to people too! Many of these active fish are very personable. Wonderful antics they display include greeting their keepers and dancing in anticipation as they beg for food. These endearing characteristics alone make them a favorite attraction for many aquarists! There are all sorts of different African cichlids. They range from stocky rock-dwellers like the Mbuna species, free-roaming browsers like the Haps, to sleek open water swimmers like the Sardine cichlids. Then there are Goby cichlids that live in the shallow waters along the shoreline. And just like ‘gobies,’ they perch on the rocks and then hop and skip from place to place. Shell dwelling cichlids find abandon shells to call their homes and the Featherfin cichlids have, yes, long flowing ventral fins that can extend as far back as their tail fin. Dwarf cichlids, Sand cichlids, Julie cichlids… the list go on! If you’re looking for unique and interesting fish, put the African cichlids at the top of your list. African Cichlids, Information and Care has a lot more details about the rift lakes; Malawi, Tanganyika, and Victoria, as well as the West African Cichlids and the African Dwarf Cichlids, and types of fish from each area. 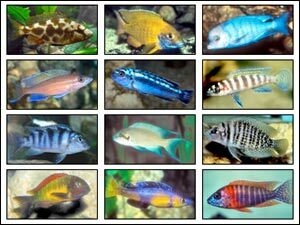 Each fish has its own little differences too, so check out each type of cichlid individually as well!